Rich tasting banana parfaits can serve as a healthy breakfast, energy snack, or crave-worthy dessert. Part smoothie, part pudding, part healthy dessert, it’s the peanut butter streusel that keeps me coming back for more. The streusel part of the recipe is triple the amount needed for a batch, which means you can save the extra streusel to have plenty on hand for next time and the next. And if you enjoy peanut butter treats like me, there will be repeat performances very soon. 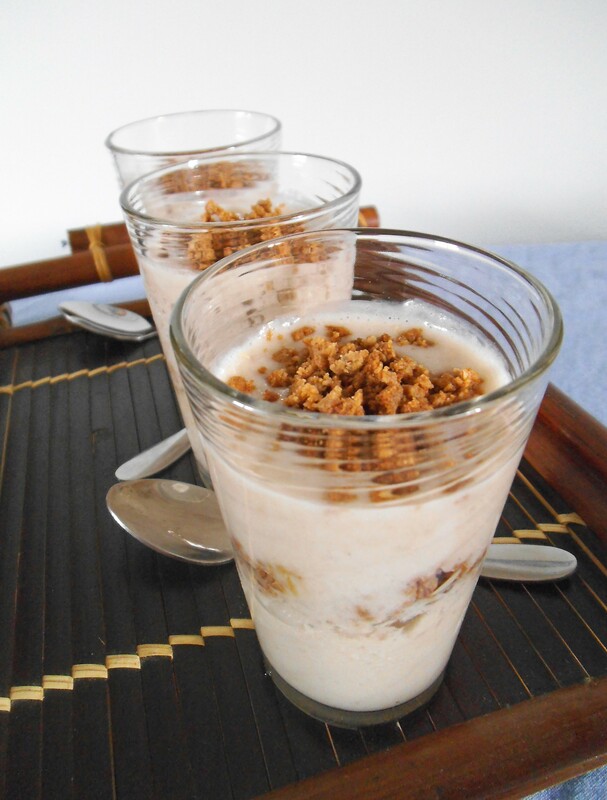 In fact, I bellieve I’ll whip up these parfaits again for breakfast tomorrow. In a blender, combine 2 bananas and 2 cups of milk. Blend until smooth. Chill for 15 minutes or longer, until slightly thicker. Meanwhile, into a medium mixing bowl, add coconut flakes, flour, and baking soda. Stir in peanut butter, brown sugar, and vanilla until an evenly mixed dough forms. Press the dough flat onto a parchment-lined baking sheet. Bake at 300 degrees F (150 C) until top of streusel is crisp, about 15 minutes. Let cool completely and then break up into a crumbly streusel. Fill serving glasses half-way with chilled banana smoothie mixture. Add a layer of peanut butter streusel. Pour another layer of banana smoothie and top with plenty of peanut butter streusel. Serve parfaits cold and eat with a spoon. Here is where I like to share recipes. I’m also sharing this at Allergy Free Wednesdays. What a fantastic treat to start the day off! Yes, it is! Hope you get to try this smoothie! Highly repeatable! Yum! These look delicious! I bet my whole family would love these, especially the peanut butter streusel! 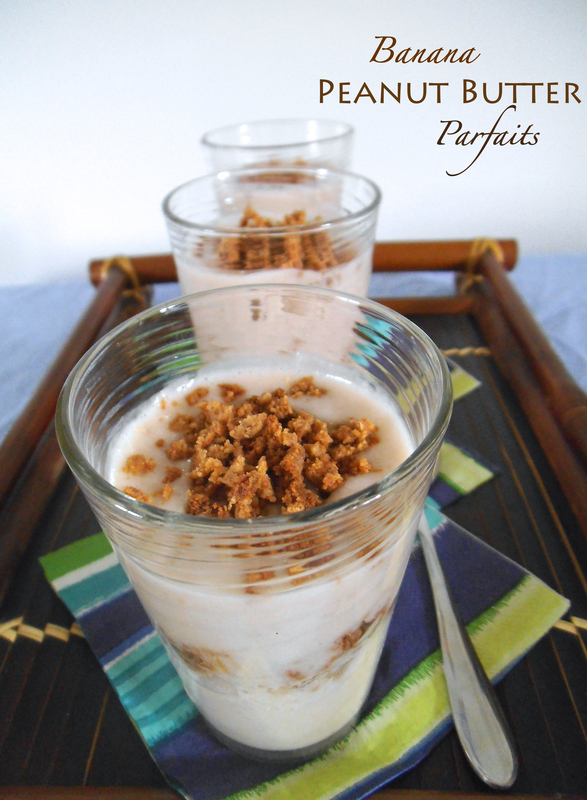 I hope you get to try the parfaits some time! Thanks for stopping by! Love this! What a great summer-time breakfast idea. Can’t wait to try it!